In eighteenth-century England, the murder of Sir Edward Crick sends a torrent of gossip breezing through Oxfordshire; although, aside from his sister, Lady Lydia Farrell, few mourn the young man. 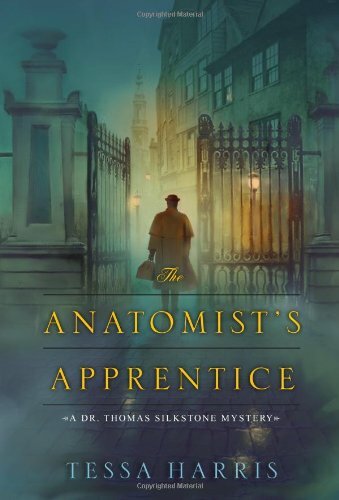 When Lady Farrell’s husband becomes the prime suspect in the murder, she enlists the help of Dr. Thomas Silkstone–an anatomist and pioneering forensic detective–to solve the murder and prove his innocence. Though Dr. Silkstone studied medicine in England under the foremost surgeon in the region, his unconventional methods and unfamiliar field of study have made him an outsider. Still, he agrees to examine Sir Edward’s corpse, but the keenest blade he will use is his intellect. He must determine both the cause and motive of this suspicious death in what will be the first of many cases. This is the first book in the new “Dr. Thomas Silkstone Mystery” series. I wasn’t quite sure what to make of it when I saw the notes on the list of offerings for the month. But being an enthusiast of Period Mysteries I just knew I would have to delve into it and see what the author could do with the subject matter. Dr. Silkstone is a pioneer in what is today called Forensic Pathology. The science of the body and finding out how and why it died. He is an American Colonist studying under the tutelage of the very well know surgeon Dr. William Carruthers. In fact Dr. Silkstone is his premiere student, whose skill with the scalpel was the envy of all the other students. When a strange woman (who introduces herself as Lady Lydia Farrel) appears at his apartments asking for his assistance in the investigation of her brother’s death and the possible killer being her husband, Dr. Silkstone accepts her request and arranges to go to Oxfordshire and meet with the Coroner before the inquest and offer his services. This heinous murder has a plethora of possible killers, and the death was caused by devious and at the time undetectable means, truly a challenge to Dr. Silkstone’s skills and abilities. He will single handedly be inventing the skills to detect and prove the means of death. While enjoyed the mystery involved very much, I did feel that the story dragged in a few places. I hope in the future the author will try to tie things up a bit more neatly, bringing the causes, and the people involved to a less dragged out conclusion. All in all it was a challenge to my mind and I recommend this book to lovers of medical and forensic mysteries. FTC Full Disclosure: I was sent this book by the publisher who asked only for a fair and impartial review.